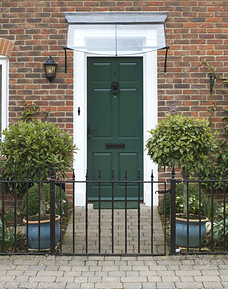 Gates and railings to complement your surroundings. Beautifully. They say good fences make good neighbours, and the same certainly holds true for good gates and railings. As a fundamental element within both the urban and rural environment, they need to harmonise with the architecture and surroundings of which they form a natural part. For period and listed buildings, historically authentic gates and railings make a vital contribution to the integrity of the architecture. In contemporary situations, developing a more minimal style is an opportunity to extend the design intention and enhance the aesthetic experience. Challenge Engineering Works designs and fabricates gates, railings and other exterior metalwork in both traditional and contemporary styles, and in a range of finishes. Our aim is always to create solutions that combine visual appeal with practicality, durability and affordability. Bespoke design, build and installation. Challenge Engineering Works fabricates metalwork for every conceivable exterior location and use. Magnificent estate gates, modest cottage garden gates, authentic period railings for listed townhouses, contemporary railings for cutting-edge new builds – all are well within our capability. 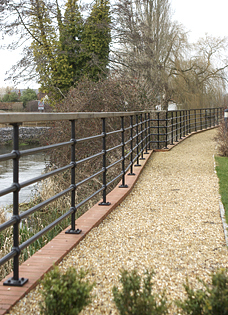 If you are seeking estate railings, we can supply them by the metre – or the mile. Or we can design, build and install a whole range of other bespoke exterior metal fittings, ranging from spiral staircases to Juliet balconies. The majority of our exterior fabrications use mild steel or wrought iron which we galvanise and powder coat in a multitude of colours. However, we have the capability to create gates, railings and other fittings in cast iron or marine grade 316 stainless steel in satin, polished or mirror-polished finishes. Our service includes installation and any groundworks that may be required.